FD Contracting LLC was looking for something different and something that worked for them instead of just being a 3 page existence on the web. 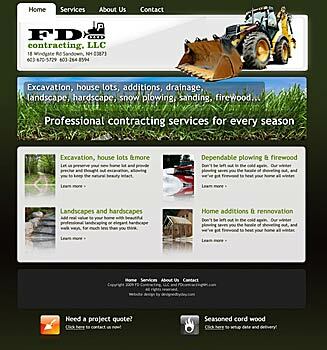 Originally a static website, FD Contracting has the Designed By Day CMS integrated along with some basic SEO work. John Ferriera, the owner, is continually asking how we can make his site work harder and stand out from the competition. Additional SEO work and features are always being added to fdcontractingnh.com. John does absolutely amazing work. This summer John came in and did some excavation work in my backyard, providing me with more usable space, a place for a patio I will build next season and was extremely fair-priced.